Craft in America, the Peabody Award-winning documentary series, is an inspirational journey to the artists, objects, techniques, and origins of American craft. Borders and Neighbors will delve into the artistic heritage of Mexico and how it has contributed to our country’s creative landscape. These episodes will shine light on personal stories, cross cultural perspectives and historic context and will provide new avenues for community and understanding, stimulating critical thinking about the relationships between the U.S. and Mexico. 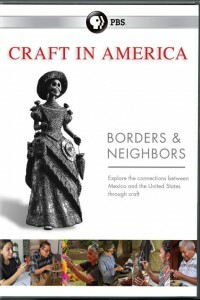 Borders explores the relationships and influences that Mexican and American craft artists have on each other and our cultures. We begin in Los Angeles with the Day of the Dead celebration, master altar builder Ofelia Esparza and Self Help Graphics & Art, the organization that first brought this event to the U.S. in the 1970s. We travel to Oaxaca, Mexico to experience Día de Muertos and to meet the Vásquez family of weavers who have revived and continue centuries-old methods in their craft, integrating ancestral Zapotec motifs into their work. American artist Jim Bassler, who lived and worked in Oaxaca for many years, takes us to the Oaxaca Textile Museum where we see contemporary and historical weavings made with feathers. Jim and his wife, potter Veralee Bassler, then lead us back to Los Angeles, to the colorful Oaxacan Guelaguetza festival and parade. We visit with Jim and Veralee at their home studio in Palm Springs, which is filled with Mexican folk art, long connected to the mid-century design aesthetic in America. Back in Oaxaca we meet Chicago artist Kiff Slemmons who works with maestro Francisco Toledo to create innovative and beautiful paper jewelry at the Art Paper Workshop, where artisans are practicing the ancient art of papermaking using local plants. This episode reveals that art is without borders. It is a pathway for creativity and the connections that make us all human. Neighbors takes viewers to and from the U.S. and Mexico, exploring the people, history, traditions and crafts, noting how aesthetics cross over from one country to another and back again in a living and ongoing cultural exchange. We meet California ceramic artist Gerardo Monterrubio, whose work is inspired by murals as well as contemporary art forms such as graffiti and prison tattoos and drawings. We travel to Oaxaca, Mexico to meet ceramic artist Magdalena Pedro Martínez at work on her series of black clay female figures dressed in traditional indigenous attire. We also watch as her brother, world-renowned artist Carlomagno Pedro Martínez, creates clay figures of Zapotec characters and stories. Los Angeles glass artist Jaime Guerrero, born of parents who emigrated from Mexico, creates life size glass sculptures that represent children at the border. We film him at his studio in L.A. and at the state-of-the-art facilities at the Corning Museum of Glass in New York. We return to Mexico where in the 1930s, Taxco became a center for jewelry production through the entrepreneurship of American architect and designer William Spratling. We meet a new generation of jewelry designers – including Carmen Tapia, Miguel Angel Ortiz Miranda, Cristina Romo and Eduardo Herrera – who are carrying on the art of silversmithing in new and modern ways. We explore murals in Los Angeles with Judy Baca and other artists who carry on the traditions of Mexican maestros Diego Rivera, David Alfaro Siqueiros and José Clemente Orozco.